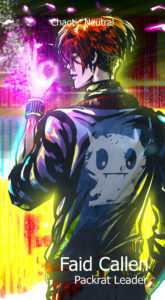 The grydscaen RPG Trading Card game is a labor of love that was created to add to the cyberpunk grydscaen series. Also a full Tarot deck that can be used for Tarot readings, the cards can be used to play the grydscaen RPG Hack the Mainframe role playing game. Using images from the grydscaen series, all artwork in the original deck is done by Natsuya Uesugi with special interest taken to highlight the characters and their personalities. Created over a six month period the game mechanics are fast paced and pit cyber terrorist hackers trying to hack the Elite government mainframe against government cyber security agents who are tasked to stop their infiltration. Individual trading cards and booster packs can be ordered directly from Natsukoarts Design Studio in a few months. Full Tarot decks will be available later. Check back for more detail. Trading cards are also available at conventions. 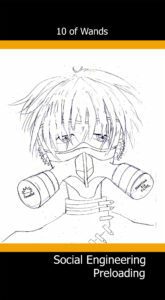 Visit Natsuya Uesugi's table next time we are at an anime convention. Check out a few of the cards in the deck. 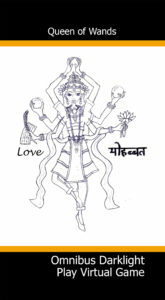 All artwork for the main tarot deck by Natsuya Uesugi. The Faid Callen Fool card highlights the leader of the cyber terrorist Packrats in all his Level 9 hacker glory. His signature flaming red hair is his calling card. 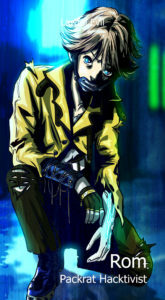 Faid is the Saicho and directs the activities of the hacktivist group. 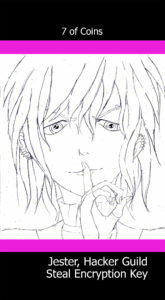 Illustrated digitally done while Natsuya was in art school studying animation, this card leads the Major Arcana. 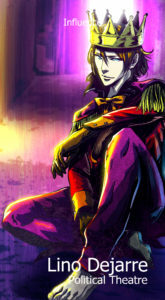 The Julian "Blue" Iskafiin card represents the Lovers. Blue is in love with Faid and they are mate pairs in the grydscaen series. Blue is a Psi Faction government operative who does not speak and uses his psychic power to send for all his communication. He loves motorcycles and the glam band Athens. 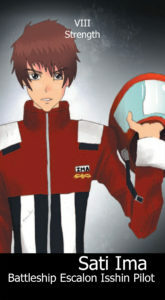 Sati Ima the Pacific Territories Quadrion Isshin Air Force pilot graces the Strength card. His card highlights the struggles of mental illness as he has schizoaffective disorder and must take medication daily and be screened to continue to fly. We wanted to highlight mental illnes not so much as a disease but as a challenge that can be faced to thrive and overcome. 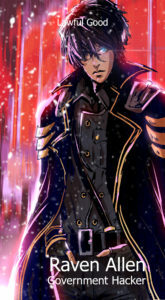 The Sun is an opponent card and features Zoon, the leader of the military-run Psi Faction and one of the three leaders of the Triumvirate that runs the Elite government. 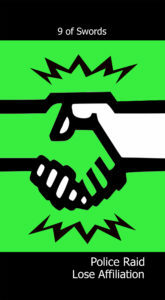 If you are playing as a cyber security agent, form an affiliation with Zoon early to have a shrewd negotiator on your side who has access to government resources and can stop a hacker in their tracks. The Wheel of Fortune card features Wraith, the Psi Faction operative and drug dealer in the series. 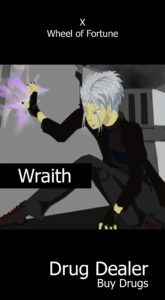 Wraith is an operator and plays on the hearts and minds of those that use his services. Wheel of Fortune is a fate card that affects the cards around it in a Tarot reading. The Jester hacker card from the Coins Suit marks the second hacker character that you can partner with in the game by forming an affiliation and stealing data, encryption keys and IDs during game play. 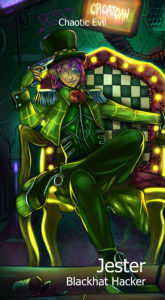 Jester is the eccentric, gothic aristocrat leader of the Jester Hacker Guild and the main character in grydscaen: dark. The Queen of Wands card is the penultimate card in the Wands suit. Featuring Omnibus Darklight the virtual reality game avatar from the gridscan game Darklight, players jack in and fight in a virtual game grid. Watch your back! The virtual game is illegal and deadly. Tournaments are banned by the government. Use this card to gain reputation tokens in the game. The Swords suit are Trap cards that can be used by the cyber security agents in the game to stop the hackers. 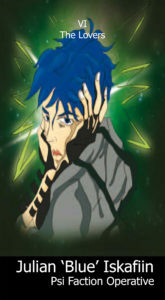 The 9 of Swords card enables a cyber security agent to raid the hacker right as he is trying to steal government data. Use this card on your turn to steal virus tokens from the hacker. The Cups suit includes the Attack cards hackers can use to attack the government. Gather hacker skills by collecting Cups cards from the GoTo pile on your turn. Add up your points to attack your opponent. 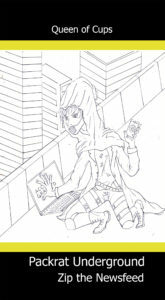 The Queen of Cups card features Rom the Level 9 hacker as he zips the Newsfeed from the roof sending nonsense graphics and taking over the feed so he can broadcast his subversive podcast Packrat Underground. The Wands suit are skill cards that the hacker player in the game can use to enhance Cups attack cards and increase points. Ready for the Zombie Apocalypse? The Preloading card got you covered. Use this and other Social Engineering cards for role play with your main role playing character. 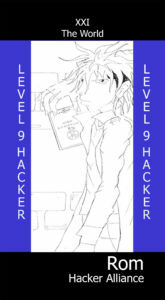 Featuring the Level 9 hacker Rom, use the World card to forge affiliations with other hackers in the game and create alliances to take down the government cyber security agents. This card allows you an extra affiliation that can be useful as you role play your main character in the game. The grydscaen RPG trading cards include stats you use to gain points as you win cards during game play. The four card stats are: Intrusion, Social Engineering, Network and Hardware. Each card has stat points for that character, skill, or action. Player cards have 4 stats and helper cards have 2. Combine card points to attack your opponent on your turn. Cards and skill stats can be combined to perform more complex attacks. The Hacker Booster Pack character cards represent the main hackers from the novel grydscaen: dark. These cards enhance your role playing experience as you play as one of the main characters then partner with a hacker for more actions and a robust full RPG experience. Stats on the back of cards show skill strength and can be combined with attacks and trap cards to propel the story. The leader of the Jester Hacker Guild, Jester is the insane blackhat hacker who infiltrates streetlights, government systems, hacks into cars and the stock market. He is a criminal of one of the most malicious hacker guilds in the Pacific Territories. 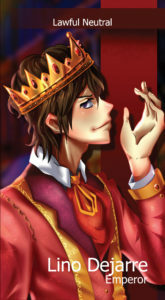 Play Jester if you want a touch of chaos, schizophrenia, and righteous indignation in your role play. Jazz is the techno fetish, straight edge leader of The Soul Deep jet jockey underground and has one of the best trailing jock rigs in the business that can infiltrate any system. Jazz is an informant to the Psi Faction and plays both sides. Play Jazz to be privy to government secrets and use them against your cyber security opponent. Faid is the high-end host of George Shimazuri, a corporate board member of the SenseNet. He is leader of the Packrat cyberterrorist hackers and doesn't play around in bed or trolling corporate clients George orders him to attack. 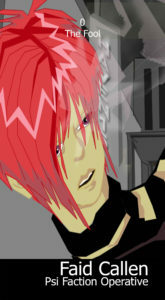 Play Faid if you are the hacker attacking the SenseNet thwarting government cyber security. Or, play both sides with Faid if you want to obscure your strategy and go in for the kill. Rom is the 16 year old elite Level 9 hacker who is homeless and attacked the stock market on Jester's command. Play Rom to make affiliations with other solo hackers who seldom work together. The Rom card allows you to pull extra virus tokens and make hacker teams to attack the Corporation and the government. 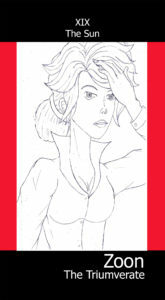 Raven is a clandestine operative and hacker for the Elite government working out of the Psi Faction. He was arrested for hacking into the Pacific Territories' military and sentenced to work for the government as his punishment. Partner with Raven for access to a plethora of hacker tools if you are playing the cyber security opponent. 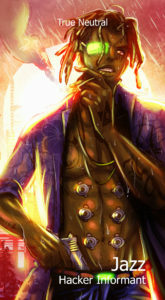 Lino is Emperor but also a clandestine psychic operative of the Psi Faction. Play Lino as an operative if you want access to intel on Jester, Jazz or Faid and are the hacker in the role play. Lino can get you into places hackers can't go, so ally yourself with him if you mean business. Lino is the Emperor of the Pacific Territories and plays a shrewd political game in Parliament. Gain intel on government targets and carry out political assassinations of Atlantea Federation enemies. Play Lino (Politics) if you are working with Zoon of the Triumvirate as a cyber security operative protecting against the hackers. 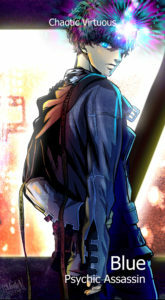 Blue, the 16 year old, decorated martial arts assassin from the Psi Faction working for the Pacific Territories military. As a chameleon, he is deployed to kill enemies by any means necessary. If you are playing the cyber security opponent, partner with Blue to gang up and spook the hacker to reveal his attacks and turn over his malware payload. The Affiliate cards are the helper characters in the game that influence or counsel main player characters like Lino and Faid. With players making deals and gaining intel from hackers both with you and against you, having an affiliate on your side can greatly help your cause. Check out all the positive stories we have to offer.